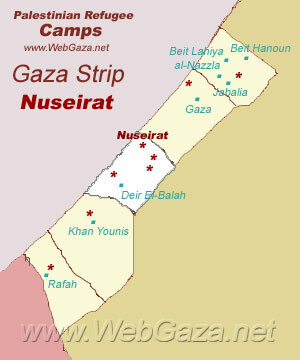 Nuseirat Refugee Camp - Where is Nuseirat Camp Located? al-Nuseirat camp is a Palestinian refugee camp in Deir al-Balah Governorate. Where is al-Nuseirat Camp Located? A busy and crowded refugee camp, al-Nuseirat refugee camp is currently home to more than 60,000 refugees. Located in the middle of the Gaza Strip, al-Nuseirat is in close proximity to the camps of al-Bureij and al-Maghazi. The 16,000 refugees who originally settled in the camp had fled from the southern districts of Palestine after the 1948 Arab-Israeli war, including the coast and Be’er Sheva. The camp took its name from a local Bedouin tribe and at first the refugees had to live in a former British military prison in the area. The blockade of Gaza has increased unemployment and caused shortages of adequate drinking water and electricity. The camp has extremely high population density, but people are unable to repair or build new homes because of the ban on importing building materials.